Fantastic news from the International Congress on Peer Review and Biomedical Publication in September. David Riley, MD, editor in chief of Global Advances in Health and Medicine presented CAse REport (CARE) consensus guidelines for integrative medicine case reporting. These guidelines have been extremely well received by journals around the globe. The CARE guidelines will facilitate standardized case reporting across all medical journals. 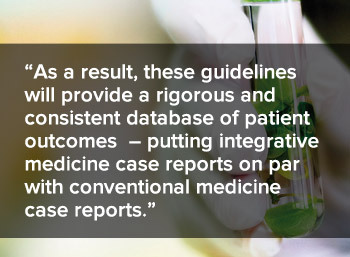 As a result, these guidelines will provide a rigorous and consistent database of patient outcomes in all areas of practice – putting integrative medicine case reports on par with conventional medicine case reports. The main tools of CARE are the CARE Statement, CARE checklist, and a Case Report Writing Template, which are available on the CARE website (www.CARE-statement.org). I am particularly excited about this because case reports are critical to establishing the validity and effectiveness of whole person, individualized integrative and natural medicine. Case reports rely on the scientific underpinning of observation as a means to assess therapeutic efficacy. I happen to believe that integrative practitioners of all disciplines are particularly keen observers. With standardized reporting guidelines that are universally accepted, integrative practitioners have the opportunity to showcase the healing potential of their practices. In addition, the CARE guidelines will certainly establish a basis for further research trials. The CARE guidelines provide a structure for a narrative of a patient(s)’ experience and include diagnosis, treatments and outcomes. Wouldn’t it be wonderful if an avalanche of naturopathic, chiropractic, acupuncture and integrative medicine case reports flooded the in-boxes of medical journals in all specialties? Even short of a flood, a steady stream of case reports would constitute a huge step forward in the validation of these holistic approaches to healthcare.